To commemorate the 100 Years anniversary of the signing of the Armastice in 1918, the Society has undertaken research into the men of Bleadon, Hutton and Locking who gave their lives in the First World War. The information is basically details of their lives, some very short, and those of their immediate family at the time. This information is now available in a new 120 page book produced by the Society. As well as information we have tried to include as many relevent photographs as possible. Copies of this book are availble for £10.00 plus a £2.00 postage charge, (non UK postage rates available on request). Cheques, payable to 'Weston-super-Mare & District FHS' should be sent to the Secretary at 125, Totterdown Road, Weston-super-Mare, North Somerset, BS23 4LW. 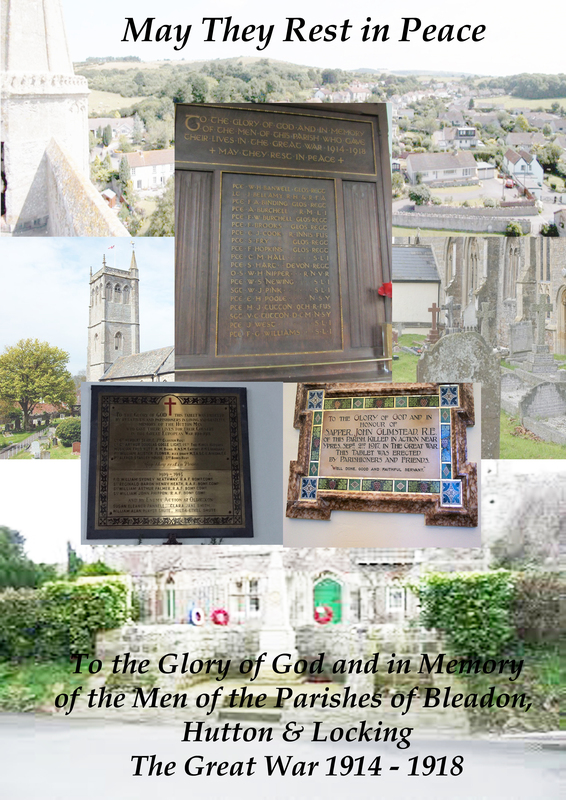 The book is produced with the help of Bleadon Parish Council and the Royal British Legion (Hutton, Oldmixon & Locking Branch).